The first surprise is that Farmgirl Fare has been nominated for a 2006 Food Blog Award in the category Best Food Blog--Rural! The Food Blog Awards are hosted by the Well Fed Network, and everyone is invited to vote for their favorite in each category. Click here for the complete list of categories. Click here to check out my competition and cast your vote. The voting ends January 9th at midnight EST. This is also a wonderful opportunity to discover great new blogs. Many thanks to Ann, Nandita, Jenjen, and Gita for nominating my blog, and to everyone who already voted for it. And for those of you who are wondering why there isn't more food on this so-called food blog (which I now personally refer to as a food & farm blog), I want to mention a couple of things--because sometimes I, too, think there isn't enough food here. 1. I often remind myself that almost everything I do (and write about and share photos of) each day revolves around food in some way--whether it's tending to lambs that will one day grace someone's table, spreading manure in the organic heirloom garden that I eat from every single day of the year, putting up hay in the summer to feed the sheep and their guard donkey throughout the winter, putting up tomatoes (into containers or into a pie) to feed myself throughout the winter, pulling weeds and raking up leaves that will one day turn into compost for the greenhouse beds, watering the flowers that lure vital pollinators to the vegetable plants, or taking care of the chickens who provide us with the most wonderful eggs. The pursuit of good, honest food is the central theme around the farm and in my life. 2. Much of the actual food & food talk has moved from Farmgirl Fare to my garden blog that sprouted up last spring, InMyKitchenGarden.com (which I consider to be a part of Farmgirl Fare). Click here to learn why it's definitely not just for gardeners. 3. One of my New Year's resolutions is to put up more posts with recipes! Update: On to the soup! I have two distinct memories regarding the making of homemade soup, neither of which takes place in a kitchen. Both are leftover from years ago, when I was a young college co-ed who did not make her own soup. My specialty at the time was chocolate chip cookies. (This is, by the way, a very useful specialty to have at any age.) About the only other culinary skill I had acquired by the time of the first memory was the ability to deftly chop chicken wings in half with an enormous cleaver. My beau at the time had taken over the lease on a tiny takeout restaurant in a not-quite-yet-chic Sonoma County town, and, although he renamed the place and came up with an entirely new menu, along with the lease came legions of customers who were addicted to the former specialty of the house--deep-fried Buffalo Wings. And so, when I wasn't studying for exams or putting batches of giant, freshly baked chocolate chip cookies for sale in the front window, I could usually be found standing by the window in my "uniform" of khaki skirt and dark green polo shirt, whacking away at wing after wing after wing. I don't know what attracted more attention from passersby--me or the cookies. It was during this time that I entered my cookies in a chocolate chip cookie contest sponsored by a local chocolate company. The semi-finals took place in various spots around the Bay Area, including in a little cafe just a few blocks away from our restaurant. And so on the day of the contest, late as usual, I trotted down the street carrying a still warm plate of cookies. And this is where we come back to the soup, because it was while watching the judging that I learned that the specialty of this little cafe was homemade soup. ** They offered a new flavor every single day, specially concocted by the chef. The soup that day was something like carrot and cumin. I had never even heard of carrot soup. For a few moments I was in absolute awe. I could not begin to fathom the enormous burden of such an undertaking. And then I promptly forgot about it. A few years later I had become slightly more adept in the kitchen, but between working, doing freelance design, and attending two different colleges at once, I never got around to making soup. In fact, I never got around to even thinking about making soup until one day when I was ridiculed in the employee lunch room at work. I was heating up my lunch, which happened to be a can of soup, and a fellow employee said something about loving soup. Then he gave my can a distasteful scorn. "But I never buy soup," he said. "It's too easy to make your own." I do not recall what this guy was having for lunch, but it wasn't soup. I do recall that he did not have a lot of friends at work. So why have these two memories stuck with me for so many years? Because now I know that homemade soup really is easy. Easy to make with a recipe, easy to come up with your own. The secret to soup is that there is no secret. You start with some water or stock, toss practically anything else you can think of into the pot, and nine times out of ten the results will be scrumptious. (The tenth time they will be ho-hum--but still miles better than most storebought soups.) Surprise number two. Another myth about homemade soup which needs to be dispelled is that it calls for tons of prep work. Not true. If pressed for time, you can still make plenty of perfectly delightful soups in about half an hour. While you can certainly spend time cutting up an enormous pile of vegetables into identically sized pieces, this is not necessary. When it comes to soup, the more rustic looking the better is what I say. I also prefer my soups to be all, or nearly all, blended up (the sludgier the better), which means you don't even end up seeing the vegetables. As long as everything fits in the pot you are fine. And yes, the intoxicating fragrance of soup that has been simmering all day on the stove will fill up your home like nothing else (and taste absolutely sublime once it is finally done), but while it simmers it does not require babysitting. A stir and a sniff every once in a while will adequately suffice. But even after years of creating all sorts of wonderful soups, I sometimes still catch myself putting the idea of making soup on the back burner. And so the other day when I was flipping through an old splattered notebook and came upon my recipe for Squash Soup from August of 1995 (my first summer at Windridge Farm and a bountiful one in the garden), I saw an opportunity and pounced on it. I fished out the two big FoodSaver bags of sliced & blanched summer squash from 2004 that I'd discovered during a recent foray into the forgotten bottom layer of the freezer, plucked a bowl of chicken stock from the fridge, grabbed onions and garlic from the pantry, and proceeded to make a delicious and enormous pot of soup which I happily slurped up for the next several days. My original recipe called for 5 to 6 cups of chicken stock, 4 yellow summer squash (most likely crookneck), 1 large onion, and two cloves of garlic. The instructions simply said to saute onion & garlic (I cook the onion and then add the garlic during the last minute or two), add stock & squash, simmer 25 minutes, and blend. Below the short ingredient list I'd written red peppers? corn? Yep, this was the inspiration for my Simple Summer Harvest Soup. And it could also be the basis for dozens of other soups depending on your imagination and what you have laying around. I didn't weigh the squash or measure out the stock when I made my spur of the moment version the other day--I just used what I had, then added a couple of big onions and several cloves of garlic. I wanted a really thick soup. I considered roasting the garlic (which would have been very nice) but didn't bother. A dollop of sour cream and some fresh Italian flat leaf parsley from the greenhouse made tasty garnishes. I placed thin slices of Monterey Jack cheese on the very last bowl and actually moaned out loud when I took the first bite. The creamy cheese immediately melted into the soup in the most wonderful way. I can't believe I'd never thought to do that before. If it were summer I would have also topped at least a couple of bowls with some chopped fresh plum tomatoes from the garden. Early this morning I awoke to the confusing sound of unexpected raindrops falling on our old tin roof (which was immediately followed by the panicked realization that last night I'd left 320 pounds of feed on the back of the truck covered with nothing but a thin plastic tarp). It's been raining all day--perfect comfort food weather. Since I'd polished off the last of the summer squash soup, around lunchtime I went fishing in the freezers for a stash of some previous warm and cozy creation. But I didn't even catch a little container of stock. We are completely out of soup. I don't think this has ever happened. Surprise number three. I had planned to offer up a few more tips for super homemade soups, plus how to make the easiest chicken stock ever, but once again I've rambled on far longer than intended, so I guess they'll have to wait. But I will leave you with these three words (which longtime readers have probably already guessed): KitchenAid Hand Blender. Your life will never be the same. Contents © copyright 2007 FarmgirlFare.com. It will be a popularity contest, not a quality contest you know. Who has the time and connection to judge all five blogs. Just know that win or lose, there are at least 65 of us (when I voted) that really enjoy your writing and our visits to your life. BTW, When is your book being published? Farmgirl: I am preparing a post for this evening referencing your site and the contest. (Ya know I'm just so envious of your stamina in getting the farm up and running so quickly, while I'm still meandering around my place repairing fences and taking care of can't wait things!!) Kidding aside, you give me hope that one day it will come together. Congratulation on your nomination. I voted and I hope you win!!! I really like your blog - and I am so glad you are not doing your work naked!!! Mmmm...I love to make soup and I got a hand blender for Christmas last year. I have only just started to make my own stock (I know, it took me a while) and it has improved the taste greatly. Thanks for sharing the recipes! Say rural food blog and I think of you. Congrats! I have voted previously, but will go try to do it again if they allow seconds. Good luck on a win! Nope, they don't take seconds. But you were in second when I tried...147 votes behind first place with 151...they won't be there long! We have a very high speed connection (one of the oddities of rural Texas) and I visited other blogs nominated. I KNOW we are prejudiced but your combination of excellent photography and very real approach to food and rural life - your blog is truly special. LOVE the longer notes about soup. Complex dishes are fun for occasional - but simple soups that allow you to taste the ingredients are still my fave. I've cast my vote for Farmgirl Fare, and had a look through the other nominations. I find them puzzling a bit, especially the multiple nominations for certain blogs..I'd have thought one nomination would have been sufficient..and that the voting was the place to count numbers! I guess I should have been busy nominating my favorites, may of which were not in evidence, but I was too late. Apart from Farmgirl Fare, I did see a couple of other favorites of mine, including Melissa's The Traveler's Lunchbox, which I recommend to all who like foodblogs! I hope you win, Susan! Quite an impressive group of food sites, I can see that a lot of time goes into maintaing them. You were doing quite well when I was there voting, all my best to you. Congratulations!!! And I do think of your blog as being about food in the most fundamental way--this is where good food comes from--a farm. I'm totally with you about the hand blender - it was the first kitchen item I bought when I arrived in Zimbabwe (I had brought a pot). So many dinner possibilities with simply these items! Glad to discover your blog through the awards, and thanks for your comment. Good luck in the contest! One of the things love most about our long rainy winters is soup. We've always got a 2-3 kinds of soup and an equal number of breads in the freezer. That's my idea of a 30 minute meal! 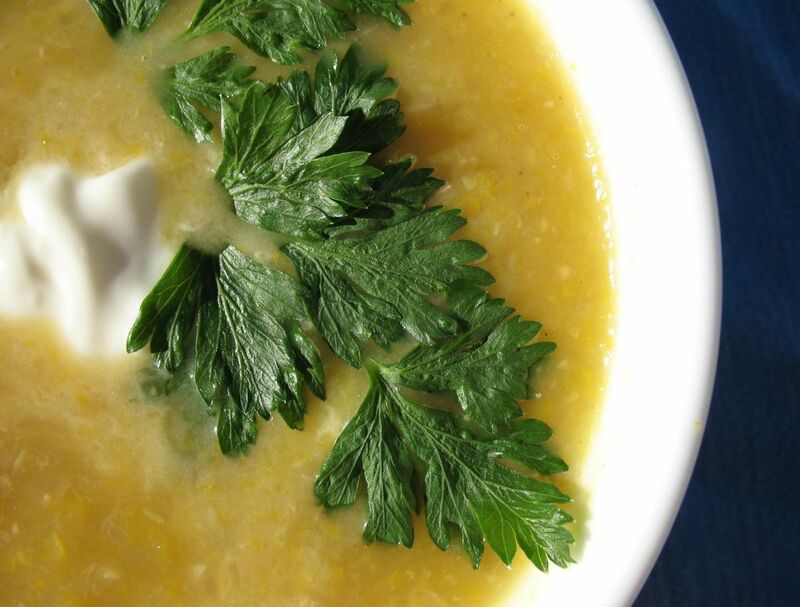 I made this recipe with a few modifications: I added a handful of chopped flat-leaf parsley, and I reduced the stock and added 1/2 cup half and half to the pureed soup. It was delicious! Even my veggie-phobic husband liked it (after the addition of Tobasco to his bowl). I love how versatile this recipe is. I'll definitely be making this again! Found your blog again while looking for freezing zucchini. Found it a couple of years ago and lost it when I got new computer. Your are back in my favorites now. Love your blog. I was born and raised on a farm in Mich. Parents sold the farm when I was 13, and oh how I thought I wanted the city life. What I wouldn't give to be on a farm now. Raised 5 children in the suburbs. Now at retirement age and not in the best of health, it is not going to be in the cards to be farming. My back forty is a 40ft. by 40ft. area behind our garage.I have raspberries across the back fence, horseradish, garlic, dill and ruhbarb that comes back every year. Being that I post hole composite, I have tomatoes that also come back every year. Green beans, carrots, basil lettuce, beets and cucumbers from seed. 2 or 3 kinds of peppers, broccoli and cauliflower plants we purchase.